Type-Right for Macintosh TypeRight is a utility that allows you to type (or mouse!) right-to-left text in Macintosh. From TypeRight you can then cut and paste your text to your favorite Mac application. Other features include remembering phrases, saving the TypeRight text file, Hebrew vowels (with the TypeRight fonts only) and more! It includes a beautiful Hebrew Mac font (Aleph-Bet) with nikudot. 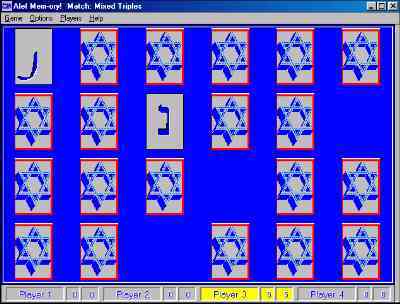 Alef-Memory Alef-Memory is a "Concentration" type memory game designed to teach recognition of Hebrew cursive and Rashi letters. Many options make the game as easy or as hard as you like. Up to 4 players. 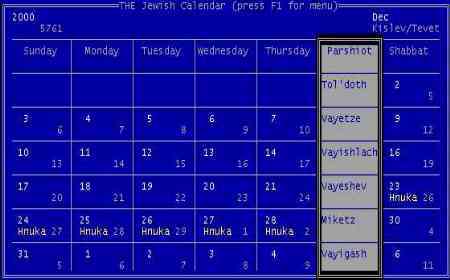 The Jewish Calendar TJC is a tiny, DOS-based Hebrew calendar program. Features include full-month display, Jewish holiday lookup, Torah portions and more! © Copyright 2002-2004, Kabbalah Software Inc. All rights reserved.